MILWAUKEE – (April 10, 2019) – Johnson Controls announced that the Tyco Visual Intelligence from Software House, a unique metric-based reporting tool for C-CURE 9000, has received the award for Best New Product in the Convergence and Integrated Software and Solutions category. 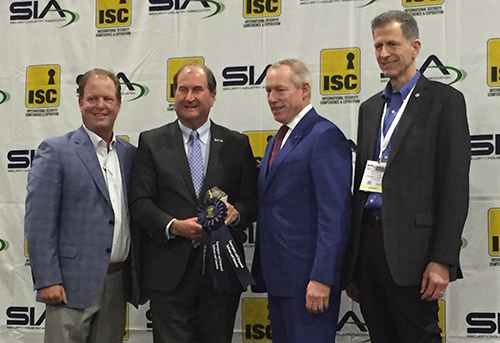 The award was presented at the 2019 SIA New Product Showcase, during ISC West in Las Vegas. Sponsored by the Security Industry Association, the annual awards program is one of the most prestigious recognitions in the security industry. The program recognizes the top innovative products in a variety of categories, including access control, surveillance and unmanned technologies, along with presenting a Judges Choice Award and Best New Product Award. Tyco Visual Intelligence is a unique metric-based reporting tool, powered by SecureVizual, to provide a graphical representation of the effectiveness of the C-CURE 9000 security solution, regardless of size. Built into the C-CURE 9000 SQL database, the tool is designed to collect Return on Investment (ROI)metrics and Key Performance Indicators (KPI) data for any activity that needs to be tracked and clearly presents it in a detailed dashboard. The dashboard helps companies monitor compliance, reduce risk and increase efficiency. "We are thrilled that Tyco Visual Intelligence has received such an honorable and prestigious award," said Rick Focke, director of product management, Enterprise Access Control, Building Technologies & Solutions, Johnson Controls. "There are no other reporting tools in the market today that offer a complete visualization of not only security site and C-CURE 9000 security and event management system data but also offer key metrics on security procedures and processes all in one robust, graphical dashboard. We are excited that our product can fill that void for the market." For this year’s SIA New Product Showcase, 81 total products were entered into the awards program which announces winners in specific product and service categories, in addition to awarding its prominent Judges Choice and Best New Product Awards. For more information on the SIA New Product Showcase winners, visit this link. For more information on Tyco Visual Intelligence, please visit www.swhouse.com or visit the Johnson Controls at ISC West in booth 20005.